There is lots of talk about what is happening with Bitcoin and all the other cryptocurrencies on the market. What you never hear much about is companies who wish to build their own applications and utilize the Blockchain technology in a way that best suits them as a company. Many of these applications are presented to other users via means of their website. And to enforce their knowledge of cryptocurrencies. A user should have the best-looking Cryptocurrency WordPress Theme website for their operations. Create Bitcoin Website with WordPress CMS! WordPress is without a doubt the largest blogging platform in the world, so it is plain to see that anyone who is running a blog associated with BTC, and cryptos, in general, will need the best WordPress theme possible to show off their content in the best up to date form. Below is the best collection of Bitcoin & Cryptocurrency WordPress Themes to build perfect Bitcoin websites. 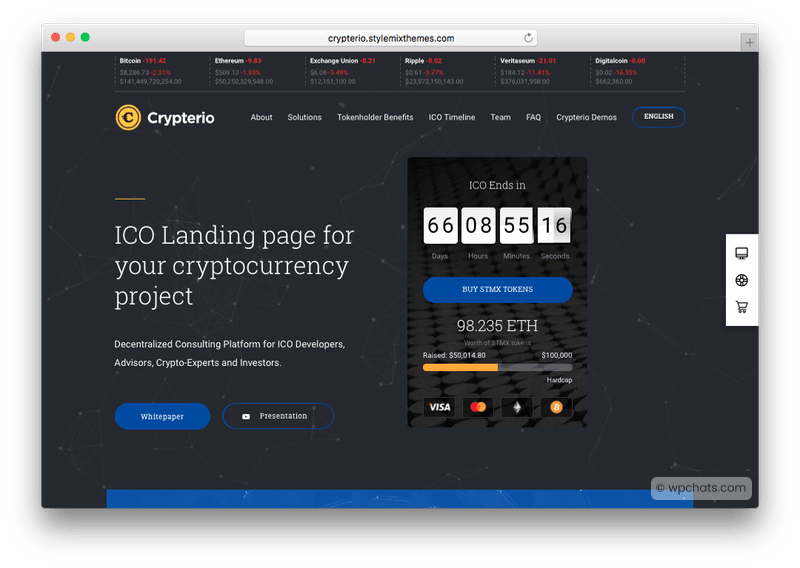 Crypterio is an excellent Bitcoin, ICO and Cryptocurrency WordPress theme which has been designed with cryptocurrencies and ICO consulting in mind. It is in fact so adaptable that Crypterio is perfect for any cryptocurrency project you have in mind. This can go as far as crypto-consulting, cryptocurrency trading, cryptocurrency investing and independent ICO advisors plus more. Crypterio Cryptocurrency WordPress Theme comes packed with a clean design, advanced ICO launching countdown, crypto coins converters, real-time exchange rates, ICO landing pages, blog templates, live exchange tables and graphs and numerous other useful add-ins which can make your site stand out. 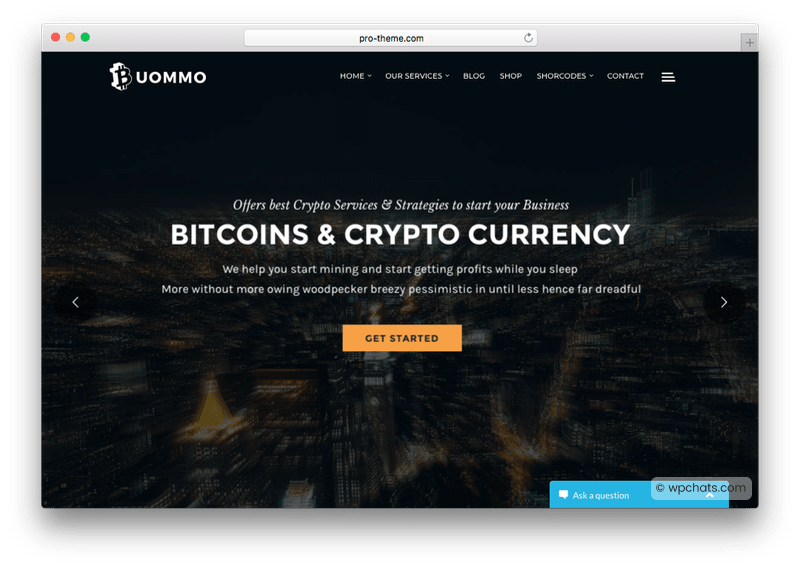 Uommo is another great design for Bitcoin & Mining, Cryptocurrency News WordPress Theme. For any individual who is involved with Bitcoin-mining, crypto news or many other areas of cryptocurrencies. Uommo is ideal. Any requirements you have are easily adapted and changed and comes with a visual composer and slider revolution among other things to make your site better but your life easier. Uommo Cryptocurrency WordPress Theme comes with 100+ elements, 550+ options to build unique and outstanding Bitcoin website for your clients/customers. It has been built with many features that include header style options, Google fonts, 100+ thematic icon, live CSS editor, WooCommerce shop integration and many more. 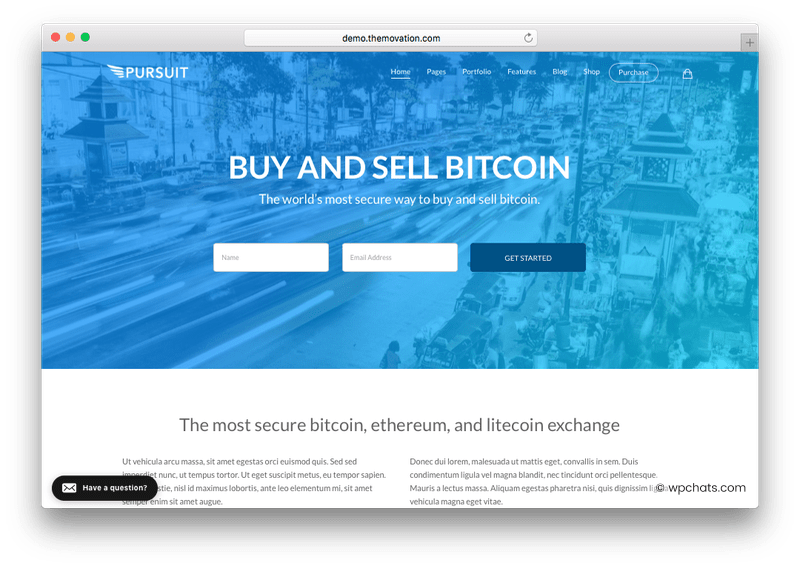 Pursuit is a powerful Cryptocurrency WordPress theme design for Cryptocurrency Exchange, ICO, Digital Wallet and Bitcoin WordPress Theme. It has been built with Elementor plugin which will help you to build your own customized web pages with ease of drag and drop widgets. With over 25 templates and 40 widgets, this theme leaves no one lacking in functionality. If you have an interest in Cryptocurrency exchanges, ICO, and digital wallets, there is everything you need to get you on your way. The Crypton theme is one of many multi-purpose BTC WordPress themes available. It is though one of the largest, so everything is included to cover all aspects. 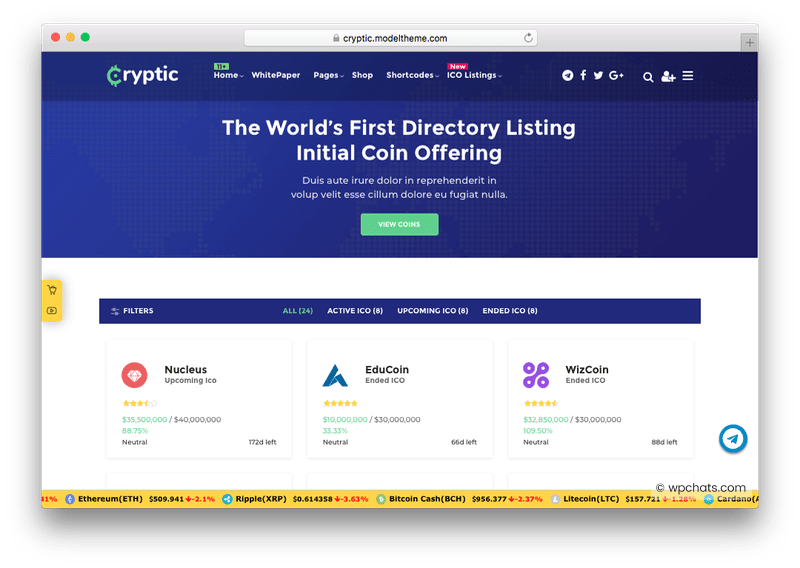 There are cryptocurrency pages, online wallet registration system, Cryptocurrency All-in-One Plugin, shopping online with cryptocurrencies templates, exchange rates, and LMS plugin. Widgets are well catered for and include current price and also multi-currency calculators. 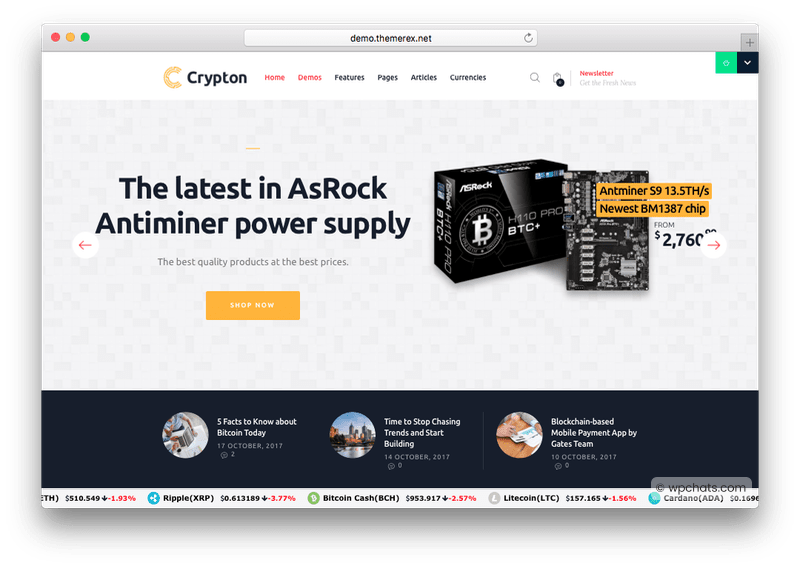 Crypton Bitcoin WordPress Theme comes with crypto shop, crypto magazine and crypto coach. It is also integrated with cryptocurrencies donate plugin through QR code of bitcoin and current prices for all coins with prices widget. Coinster WordPress theme was initially designed so it could become a website that dealt with BTC, Bitcoin-wallets as well as other cryptocurrencies and altcoins. There are dedicated pages for mining equipment if selling it is your thing, or you can use the drag and drop page builder to fully customize your pages. It also has full integration with MailChimp for that all-important mailing list. For any online sales, there is also integration with WooCommerce which can help simplify that kind of task. 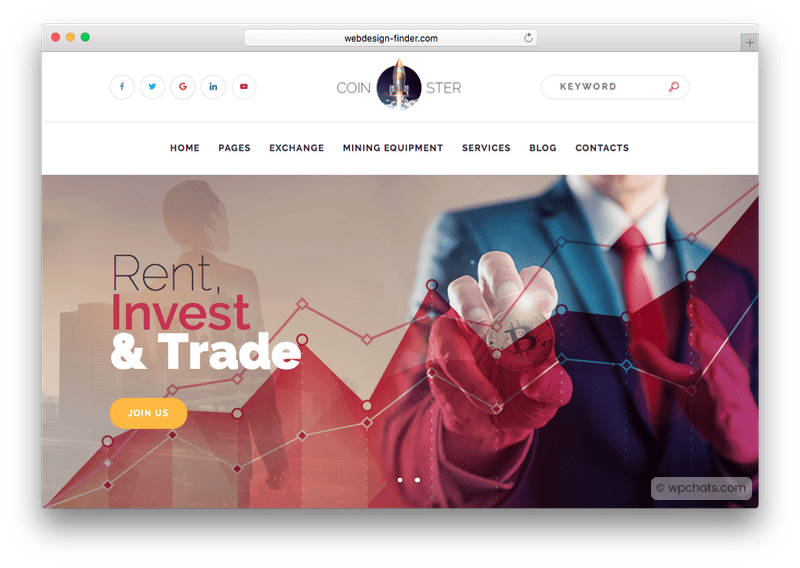 Being a powerful WordPress-theme there is more than enough power to help solve all of your cryptocurrency business ideas in one easy to go to place. Cryptic WordPress theme is another wonderful design for Bitcoin & cryptocurrency based websites. It has been specially built to use for Cryptocurrency Investments, cryptocurrency exchange market, ICO Advisor, professional crypto-trading consultancy, Bitcoin trading and ICO Agencies websites. Although there is no coding required, everything has been fully optimized for the fastest possible performance while maintaining SEO efficiency. It includes CryptoCurrency Price Converters, Crypto WhitePaper (White Paper), Timeline ICO History and much more. 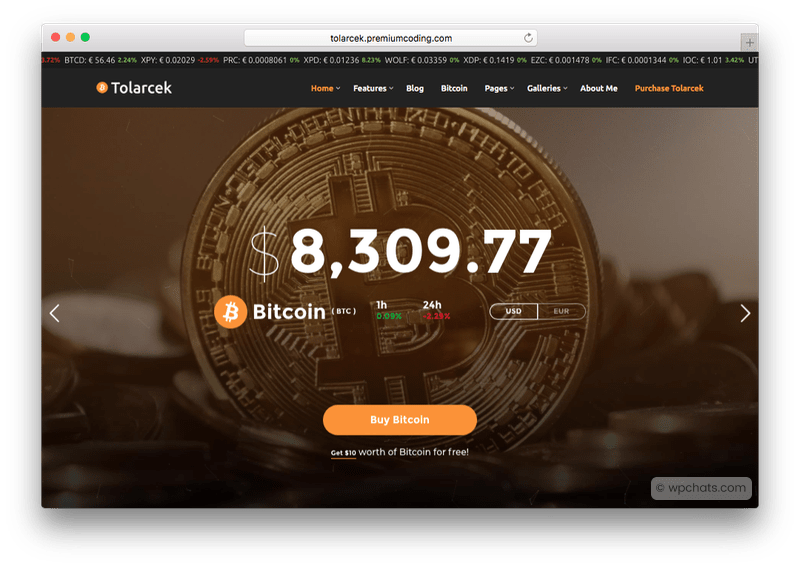 Tolarcek Cryptocurrency WordPress Theme is based on simplicity without losing any functionality. It is a Bitcoin WordPress theme built for CryptoCurrency blogs. It comes with 6 fantastic homepages and blog layouts, so now you can create the site of your dreams with tools which are encompassed in a fully responsive theme. It comes with a free bitcoin WordPress plugin for Bitcoin and crypto industry! Fast loading times are guaranteed, and SEO is well taken care of so your content can be made available to all the crypto-junkies you wish to reach. 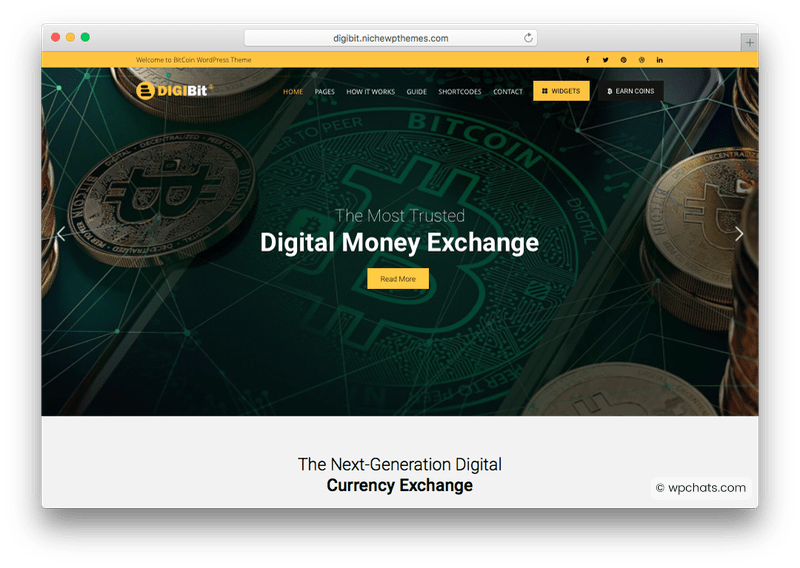 Digibit is another great Bitcoin & Cryptocurrency WordPress Theme to use for ICO, Blockchain, coin trading, bitcoin, coach and coin widget websites. These are the number one theme and for a good reason. BTC has so much exposure, and the theme has been designed to present the coin in the best possible light. It is fully responsive and retina ready, so any device is well catered for. There are also some inbuilt page layouts for custom layout builder for the header, mega menu, and footer layout! Crypto compare widget with other coins like Quebecoin, EtherDelta, ZoomCoin, WishFinance, BosonCoin, RipOffCoin, FireCoin , Halloween Coin, Honey and CryptoFocus to name just a few. 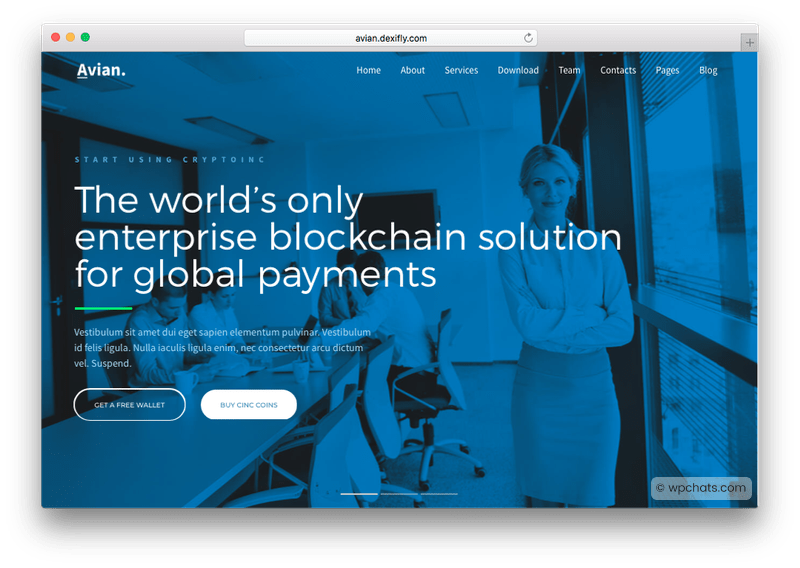 The Digibit WordPress theme also comes with over 85 unique elements and 11 custom cryptocurrency widgets which is more than enough to cater for any design of the inner pages of a site or blog. Avian is one more multi-purpose one-page Cryptocurrency WordPress theme which has been designed for cryptocurrencies, ICO & Blockchain websites in particular. The focus is on minimalism, so there is no need to blind any of your followers with too much science. Avian Bitcoin WordPress Theme comes with plenty of unique plug-ins you can use to spice up your site. These include a visual composer, revolution slider, and on-screen animations. Page ranking is aided by the built-in SEO and being responsive and retina ready there is no worry of additional work getting your site to display correctly no matter what the device. Avian is so well crafted that you might use it as it is out of the box without wanting to change anything. 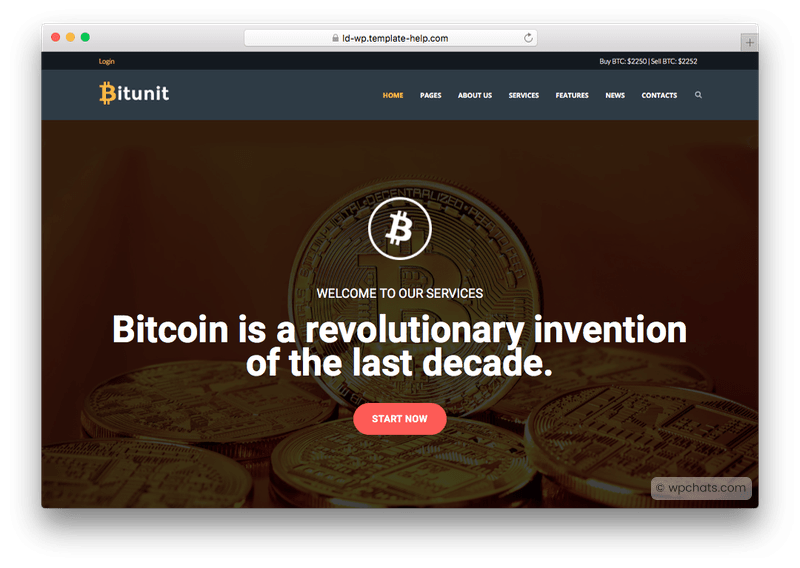 Bitunit is another great addition to Bitcoin & Cryptocurrency WordPress theme from TemplateMonster developer club. This theme is specially designed to use for Bitcoin, Cryptocurrency, coin trading, finance consulting and ICO Blockchain related websites. It was designed with all necessary features to create Bitcoin websites, such as Bitcoin to currency calculator and Bitcoin widgets to use on the sidebar or desired sections. Bitunit WordPress Theme has built with drag and drop elements of Elementor visual composer plugin, which is coming with 40+ custom shortcodes widgets, header and footer layouts, live WordPress customizer options and many more.